Various Artists - Berghain 08. Vinyl EP. Bleep. Three years on from Function’s moment-in-time Berghain 07 mix and OstGut veteran Fiedel comes through with the follow-up. The 140-minute epic is available for free online, but this 12” is the place to come if you want to get your hands on full-length versions of some of the mix exclusives. 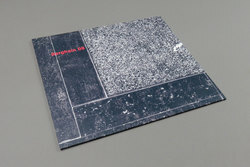 It kicks off with two pieces of classic Berghain fare. Both Electric Indigo’s ‘Registers’ and Stefan Rein’s ‘Panther’ are the kind of dubby, tense tech-house that have soundtracked many a two-day session in Panorama Bar. rRoxymore’s ‘Tropicalcore’ is lighter and more limber, recalling the Livity Sound/Timedance/Hessle Audio school of funky post-Dubstep. Fiedel and Berghain heavyweight Boris close the record out with an acid-flecked DJ tool.